This article provides a brief discussion of and suggestions regarding visual resource assessment and visual impact assessment of Australian Landscapes. References are provided at the end for the Author’s article. Copyright © 2018 by Dennis N. Williamson and Geoscene International (a division of Scenic Spectrums Pty Ltd). All rights reserved - see end of article for re-use arrangements. In Australia and many other countries around the world, the formalised practice of visual (or scenic) resource assessment and visual impact assessment of landscapes has been around since the early 1970s, perhaps longer if we look at some of the early work of people like Dame Sylvia Crowe, Burton Litton, Donald Appleyard, Kevin Lynch and others. The U.S. Forest Service’s Visual Management System (VMS) is one of the world’s first truly systematic procedures applied extensively at landscape scales to National Forest lands across the United States during the early 1970s. A series of National Forest Landscape Management hand-books, including Litton’s work on forest landscape description and basic terminology, the VMS procedure (in what some referred to as the ‘big eye’ book – see Figure 1), and a number of other volumes that addressed specific visual management issues related to timber harvests, roads, and utilities. The VMS concept was logical and relatively straight-forward, fitting in as part of the overall multiple-use planning process with other forest resources. I was fortunate to be in on the ground floor of this visual resource management movement as a young Geographer working for Lolo National Forest in Montana. During 1977, two U.S. Forest Service Landscape Architects (Richard Hammond and Ken Keefe) and I arrived Australia to adapt the U.S. VMS to approximately 6 million hectares of Victoria’s State Forests. The basic approach of the Victorian VMS remained much the same, as documented by Williamson and Calder . However, new Landscape Character Types were described and delineated for the whole of Victoria and the terminology of the visual quality objectives was changed, using the concept of visual evidence or dominance to determine management targets. The resulting visual objectives for landscape change or alteration were ‘Inevident’, ‘Apparent’ (but not 'Dominant’) and ‘Dominant’ alterations. As an added verification and improvement to Victoria’s VMS scenic quality assessment criteria, we conducted scenic perception research on 56 representative landscape scenes of forest, pine plantation and agricultural landscapes in the Ovens Valley and Mount Buffalo area of northeast Victoria. Photographs of these scenes were rated on a 7-point Likert scale (very high to very low scenic quality) by 348 observers, representing the community and different interest and age groups. A series of physical and abstract landscape dimensions were measured as percentages or areas of each test scene. These were correlated statistically against the mean scenic quality rating of each scene, based on the mean Likert (Q-sort) scores of study participants overall (see Figure 2). The research results showed a high positive correlation between scenes rated highly for their scenic quality and the presence of such landscape features and characteristics as naturalism, eucalypt forest cover, rock outcrops, and maximum distance seen. Scenic quality ratings tended to decrease for scenes with a greater presence of features such as pine forest, logged areas, flat slopes, brown agricultural fields, and buildings and structures. Eucalypt forest, rock outcrops, total tree cover, alpine grasslands and water explained over 76% of the variance in perceived scenic quality at a 99.5% confidence level. These research results compared favourably with an earlier Massachusetts study of a similar nature conducted by Zube, Pitt and Anderson. Subsequent landscape and scenic perception research studies by such researchers as Dr. Ray Green, Jack Nasar, Stephen and Rachel Kaplan’s, Phillips et. al. and others have generally had similar findings, particularly underscoring the importance of naturalness, rugged terrain, green-ness and waterforms as positive influences on people’s perceptions of and ratings of landscape scenic quality. During 2005, a scenic perception study of the South East Queensland region was also carried out. Through 1985 (with the assistance of Stuart Calder and Michael Leonard of the FCV) we transferred our VMS knowledge widely throughout the southern Australian States through training workshops, university lectures, field days, journal articles and conferences. Foresters and engineers from various government departments were trained. We also trained a team of young Australian graduate Landscape Architects (including Steve Moss, Scott Murray and Michael Sandford) to take our place when we vacated our positions. VMS awareness and support was high among the professional and general community. The Victorian VMS procedure provided the basis for the Visual Management Systems developed by the Tasmanian Forestry Commission and that by the Western Australian Department of Conservation and Land Management (CALM) during the 1980s – both of which have since been updated. The U.S. Forest Service VMS was also updated during 1995, introducing the components of ecological unit description, scenic integrity and alternative development evaluation. Various other visual assessment procedures were developed and trialed in other Australian States by university researchers and government departments, but systematic procedures do not appear to have been adopted by State Governments for widespread use during the 1980s and early 1990s. A more thorough examination of this history is required with the assistance of those who have been actively involved in the various States concerned. During 1989 and 1992, I developed and applied my adaptation of the Victorian VMS to the Wet Tropics of Queensland World Heritage Area for its nomination assessment and for the first management plan following the area's inscription by the World Heritage Committee. World Heritage assessments under criteria (vii) of the World Heritage Operational Guidelines require the establishment of justification for Outstanding Universal Value (OUV) being evident in properties that “contain superlative natural phenomena or areas of exceptional natural beauty and aesthetic importance”. However, the World Heritage Committee have provided little in the way of specific guidance or procedures for assessing the two separate aspects of criteria (vii) – natural phenomena and natural beauty. For the Wet Tropics and other inscribed World Heritage Areas in China, Tasmania, and Western Australia, I developed new procedures and criteria. (Such criteria may again be useful as the Tasmanian Government seeks to commercialise the Tasmanian Wilderness WHA at Frenchmans Cap and elsewhere.) Since 2010-11, minor additional guidance was offered through the document Preparing World Heritage Nominations, however, not enough. Since that time, Mitchell has reviewed the assessment of this World Heritage criteria, providing some useful recommendations for a more systematic application of criterion (vii). However, there remains more work to be done and some form of global consensus to be achieved. I have played a strong role in promoting the use of visual assessment in the context of private and public lands, rural and urban, in Australia since establishing Scenic Spectrums as a consultancy during 1985. There is no doubt that there has been a distinct increase in the number of visual resource assessments since the mid-1990s, particularly in relation to visual impact assessments. This has been stimulated by a range of environmental protection laws and regulations at the Federal and State government levels and by the upsurge of large scale mining projects and infrastructure development for roads, ports, energy, tourism, urban development and other types of alteration. Government agencies responsible for the planning approvals for such developments have by enlarge accepted and required some form of visual impact assessment in the approvals process for such facilities. This also reflects the general demand by the Australian public who have shown a great deal of concern regarding landscape and scenic values. Not surprisingly, a wide array of landscape and engineering consultants have seen the commercial opportunity and provided services in visual impact assessment. And this has resulted in a plethora of different visual assessment procedures and criteria being applied across Australia - some good and some not so good. In the process, the VMS methodology that was adapted for application in Victoria, Tasmania and Western Australia has largely been lost through the cavalcade of changes in governments and government departments. For the most part, Landscape Architects have been seen as the professionals best qualified to make such assessments. Ironically, I am unaware of any Australian university Landscape Architecture or design programs that include a comprehensive subject on visual resource assessment. Most LA graduates would not have any knowledge of the basic concepts, terminology and methodologies for visual assessment when they enter the workforce. Even though Landscape Architects are fast learners and innovative, I have seen some very inadequate visual impact assessments conducted over the years. Since the early 2000s, reduced teaching and promotion of the VMS approach has led to an alternative method from the United Kingdom, the Landscape and Visual Impact Assessment (LVIA) approach, being fairly widely adapted and applied in Australia. The third edition of this procedure, known as GLIVA3, has been referred to since 2013. The LVIA approach has the same basic intentions as the VMS and includes some of the same aspects relation to the identification of landscape character. Good points also include its attempt at presenting a high-level framework for integrating visual impact assessment into the broader environmental impact assessment process in the UK and offering guidance on the assessment of cumulative visual impacts, the duration of impacts and mitigation of impacts. The latest U.S. Forest Service procedure and my adaption (Scenic Spectrums' Visual Evaluation Method) also include these considerations. It leaves decisions regarding the scope of the assessments and the criteria for making the various assessments open to negotiation between the Landscape Architect or assessor and the relevant government authority, with ‘no hard & fast rules’, leaving the procedure and criteria subject to change from one project to another. I have been engaged to peer review a few LVIA assessments and to occasionally apply the process on behalf of clients. I have often found that the reviewed assessment or requested procedure has applied the LVIA method in a non-rigorous and subjective manner, is missing key factors for consideration (such as identifying viewpoints in one example), or is lacking in transparency and clear justification for the assessments made. On one occasion, the Peer Review process itself was abused by the proponent client. The added problem with visual impact assessment is that most of the Australian government authorities, planning review panels, planning appeals bodies and environment courts have not set out basic requirements for visual impact assessments. Some exceptions to this include the visual landscape planning manual prepared by the Western Australian Planning Commission and the WA Department for Planning and Infrastructure and the recent NSW Wind Energy: Visual Assessment Bulletin. Many, if not most, of the government employees and planning approval adjudicators have not had any basic training regarding visual assessment concepts, terminology and methodology. Given the current circumstances, it is no wonder that we have trouble reaching agreement between different ‘visual assessment experts’ and among the planning decision-makers regarding what constitutes an area of high or lesser scenic quality or visual significance, and whether a proposed development will create a significant visual impact or not, as well as agreeing on what to do about that. In addition, we completely lack any consistency in visual assessment procedures and terminology from one Australian State to another. to assess the degree to which various alterations may impact on those landscapes. This is done to provide a reference to compare landscape values to other social and resource utilisation values so that decisions can be made based on a comprehensive and objective assessment. 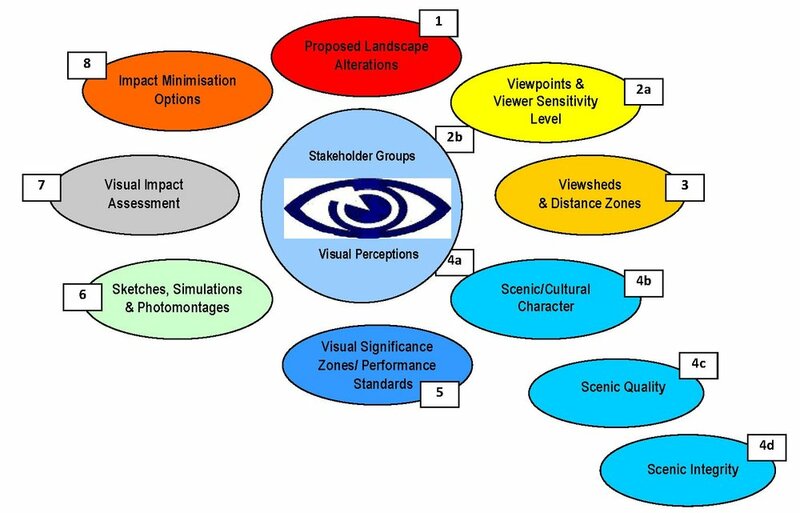 The acceptability or non-acceptability by the community of proposed visual alterations in relation to agreed visual performance standards used to assess potential visual impacts to the existing landscape and its visual or scenic qualities (where possible, in terms of the scenic perception responses of key stakeholders). Landscape and visual assessment is an inherently complex field of analysis and assessment, but we don’t need to make it any more complex than is necessary. As much as possible, a straight-forward approach in which everyone understands the terminology, methodology and criteria should be used. Reaching consensus on visual assessment methods and criteria is no doubt difficult, as is reflected in the wide range of procedures that have been formulated over the past 50 years. Perhaps the lack of detailed and transparent criteria reflected in the LVIA is also due to an inability to reach consensus on the details of such a procedure. However, I think that Australian landscape and environmental planners, designers and decision-makers need to do themselves and the wider community a favour by resolving this issue more appropriately for future application. 4. Provision of comprehensive and effective awareness-raising, education and training courses and workshops for visual assessment within the appropriate university planning and design programs, within the relevant government departments, within the field of visual assessment consultants and the relevant professional associations (e.g., AILA, EIANZ, VEPLA, etc. ), and within the relevant statutory planning review panels and courts. This training should include the basic concepts, terminology, visual perception research, capabilities of the human eye, assessment methodologies, analysis technologies (e.g., GIS mapping, use of viewline cross-sections, computer simulations and photomontages, etc. ), and (importantly) the ethics of expert assessors in their duty to represent the landscape as a valuable community and ecological resource in an objective and factual manner. Although not suggesting that other approaches cannot be valid, I believe that the thrust of a VMS methodology is much more understandable and effective than the LVIA approach that currently dominates visual assessment in Australia. I have continued to use the basics of the VMS approach as effective in addressing all of the above key assessment elements, but I have made changes and improvements to it for wider application with my Scenic Spectrums Visual Evaluation Model (SS-VEM), as shown in Figure 3. However, the LVIA process could likewise be improved if that is the general approach more people prefer. In my recent work with the NSW Department of Planning and Environment on their wind energy visual assessment, they desired to use a Rapid Visual Impact Assessment procedure with a reduced number of assessment factors to inform preliminary discussions with wind farm proponents and the community prior to developing terms of reference for a full visual assessment of projects of State significance. A preliminary illustration of such a process is shown in Figure 4. The above suggested review and revision process may take a while to initiate. I am hopeful, but a realist - it may not occur at all. Even if it does, there is no guarantee that consensus and an agreed path forward will emerge. So, for any government agencies or even private consulting firms that are currently experiencing difficulties with the application of your visual impact assessment procedures, I would urge you to conduct your own review and revisions in the interim to ensure you have an effective and operable visual assessment procedure and criteria to serve the needs of your own organisation until something better is established. Forest Service, 1974. National Forest Landscape Management Volume 2: Chapter 1 – The Visual Management System. U.S. Department of Agriculture, Washington D.C., U.S.A, 47 pp. Williamson, Dennis and Calder, Stuart, 1979. “Visual Resource Management of Victoria’s Forests: A New Concept for Australia” in Landscape Planning, Vol. 6, pp 313-341. Williamson, Dennis N and Chalmers, John A, 1982. Perceptions of Forest Scenic Quality in Northeast Victoria: A Technical Report of Research Phases I and II. Landscape Management Series. Melbourne, Victoria: Forests Commission Victoria, p. 99. Williamson and Chalmers, 1982. ibid. Zube, Ervin H & Pitt, David G, & Anderson, TW, 1974. Perception and measurement of scenic resources in the Southern Connecticut River Valley. Institute for Man and His Environment, University of Massachusetts, Amherst. Green, Ray, 2000. “Scenic and Town Character Assessment: A Methodology for Community Involvement” in Australian Planner Vol. 37 (1). Nasar, Jack, 2001. “Images of Cities” in NJ Smelser and PB Baltes (Eds. ), International Encyclopedia of the Social Behavioural Sciences. Elsevier Science Ltd. Oxford: Pergamon, pp. 1822-1825. Kaplan, R and Kaplan, S, 1989. The Experience of Nature: A Psychological Perspective. Cambridge, Massachusetts: Cambridge University Press, 340 pp. Phillips, MR, Edwards, AM and Williams, AT, 2010. “An incremental scenic assessment of the Glamorgan Heritage Coast, UK” in The Geographical Journal, Vol. 176, No. 4, December 2010, pp. 291–303, doi: 10.1111/j.1475-4959.2010. 00361.x. SEQ Regional Scenic Amenity Study, 2005. What's in a view? Report 1: Overview of the Scenic SEQ 2004 Public Preference Survey, Brisbane. Forest Practices Authority, 2016. A Manual for Forest Landscape Management. Republished by the Forest Practice Authority, Tasmania — 24-10-2006 from the former Forestry Commission Tasmania, 1990. Government of Tasmania, Hobart, Tasmania, 194 pp. Department of Conservation and Land Management, 1989. Visual Resource Management on Lands and Waters Managed by CALM. Policy Statement No. 34, Stage of Western Australia, Perth, 4 pp. Western Australian Planning Commission and Department for Planning and Infrastructure, 2007. Visual Landscape Planning in Western Australia: a manual for evaluation, assessment, siting and design. State of Western Australia, Perth, 188 pp. Forest Service, 1995. Landscape Aesthetics: A Handbook for Scenery Management. Agriculture Handbook Number 701. United States Department of Agriculture. Williamson, Dennis, 1989. An Evaluation of Scenic Quality and Landscape Alterations in Wet Tropical Rainforest and Associated Landscapes of North-East Queensland in Relation to World Heritage Standards prepared for The State Government of Queensland by Scenic Spectrums Pty. Ltd.
Williamson, Dennis, 1992. Scenic Resource Evaluation of the Wet Tropics World Heritage Area – Wet Tropics Plan: Strategic Directions for the Wet Tropics Management Agency by Scenic Spectrums Pty. Ltd. in association with ESRI Australia Pty. Ltd.
 Intergovernmental Committee for the Protection of the World Cultural and Natural Heritage, 2016. Operational Guidelines for the Implementation of the World Heritage Convention. United Nations Educational, Scientific and Cultural Organisation (UNESCO), World Heritage Centre. Paris, France, 175 pp. Marshall, D, UNESCO, The World Conservation Union (IUCN), International Council on Monuments and Sites (ICOMOS), & International Centre for the Study of the Preservation and the Restoration of Cultural Property (ICCROM), and Centre International d'Études pour la Conservation et la Restauration des Biens Culturels (ICCROM), 2011. Preparing World Heritage nominations (2nd ed.). Paris: UNESCO, 136 pp. Mitchell, N, with contributions from Leitão, L, Migon, P and Denyer, S, 2013. Study on the Application of Criterion (vii): Considering superlative natural phenomena and exceptional natural beauty within the World Heritage Convention. Gland, Switzerland: IUCN. 112 pp. Landscape Institute and Institute of Environmental Management & Assessment, 2013. Guidelines for landscape and visual impact assessment. Routledge, Abingdon, UK, 169 pp. Department of Planning and Environment, 2016. Wind Energy Visual Assessment Bulletin: For State significant wind energy development. NSW State Government, Sydney, NSW, 44 pp. Copyright © 2018 by Dennis N. Williamson and Geoscene International (a division of Scenic Spectrums Pty Ltd). Unauthorized use and/or duplication of this material without express and written permission from this site’s author and/or owner is strictly prohibited. Excerpts and links may be used, provided that full and clear credit is given to Dr. Dennis N. Williamson and Geoscene International (a division of Scenic Spectrums Pty Ltd) with appropriate and specific direction to the original content.